Today’s announcement that SoftBank is investing $1.7B in Intelsat as part of a merger between Intelsat and OneWeb is eerily reminiscent of SoftBank’s investment in Sprint and subsequent purchase of Clearwire back in 2012-13. Then the motivation was acquisition of large amounts of 2.5GHz spectrum to be used with innovative small cells to revolutionize the cellular market. Today the motivation is acquisition of large amounts of NGSO spectrum to be used with innovative small satellites to revolutionize the satellite market. There are certainly many synergies between Intelsat and OneWeb: Intelsat needs a next generation plan beyond Epic, to lower the cost of its capacity, and hamstrung by debt, it could not have afforded to build a new system on its own. OneWeb needs distribution and market access, as well as interim capacity so that it does not have to wait until the LEO system is fully deployed. So this deal makes a lot of sense, if you believe, as Masa clearly does, that new constellations will dramatically boost the future prospects for the satellite industry. On the other hand, if it doesn’t work out, would SoftBank get to the point where it is prepared to sell the assets and not even mention them in its vision of the future? However, another potential parallel is that back in 2013, SoftBank faced a lengthy challenge from DISH, which mounted a bid for Clearwire and later made an offer for all of Sprint, and ultimately forced Masa to pay far more for Clearwire than he had hoped. Now EchoStar, which had made a $50M investment in OneWeb (then WorldVu) back in 2015, but has been far less prominently involved in OneWeb’s development efforts compared to Qualcomm (with DISH even objecting to OneWeb’s use of the MVDDS spectrum), has apparently seen its mooted partnership with SES put on hold. Clearly Charlie Ergen needs to find a way forward for EchoStar to compete in the satellite broadband market on a global basis, building on the successful launch (and market lead) of Jupiter-2. Some analysts have been reiterating that this could involve a bid for Inmarsat, as I mentioned last summer, but the time for that has probably passed. So does Ergen use this development to revive the mooted SES deal, because SES will now need to compete more aggressively with Intelsat? Or does he want to be more actively engaged with OneWeb and get a larger slice of that development effort (and potentially use its capacity in the longer term)? Either way it would not be surprising if DISH or EchoStar already holds some of Intelsat’s debt, and Ergen could even seek to maximize his leverage by acquiring a larger position in the company. Does Masa want a cooperative relationship with Ergen going forward (perhaps even with a view to collaboration between DISH and Sprint in the wireless sector), or is he still upset over what happened in 2013? And returning to the theme of Groundhog Day, will this movie end with the two protagonists eventually falling in love, or will we see a repeat of 2013, with yet another battle between Masa and Charlie? As we get closer to Satellite 2017, where major new deals and partnerships are often announced, it looks like a number of players may be getting cold feet about their future satellite plans. This may be partly attributable to fears that OneWeb will contribute to a eventual glut of capacity, now it has secured SoftBank as a lead investor and raised another $1.2B. Even though capacity pricing may have stabilized somewhat for now, its certainly the case that a satellite ordered now is likely to enter the market at a point when pricing is set to decline much further. We’ve already seen a delay in Panasonic’s XTS satellite order, which was supposed to happen before the end of 2016. Ironically enough, Leo Mondale of Inmarsat said at the Capital Markets Day last October that he believed “Panasonic in Yokohama are a little wary of getting into the satellite business” and in the wake of the recent FCPA probe, Panasonic Avionics now has a new Japanese CEO. Moreover, one way of viewing the recent announcement that Eutelsat will take its ViaSat JV forward (and include aero mobility, which was not part of the original agreement) is that Eutelsat no longer believes it will strike a deal to operate Panasonic’s XTS satellites. That’s a much better explanation than bizarre speculation that ViaSat is going to buy Eutelsat, especially when ViaSat is still struggling to fund its third satellite for Asia and is openly hinting that it will need US government contracts to close the business case. Eutelsat also seems to be cutting back elsewhere, with some speculation that the Ka-band broadband satellite previously ordered for Africa may now be repurposed for other (non-broadband) applications. But the biggest news appears to be a pull back on SES’s part from the long rumored global Ka-band GEO system that I noted last summer. 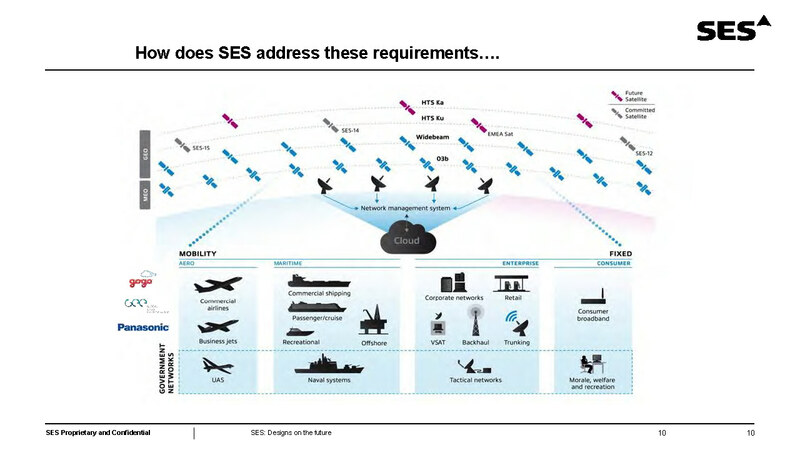 SES announced only a single satellite (SES-17) for the Americas in partnership with Thales last September, but had plans for two additional satellites, and it seemed increasingly likely that a partnership with EchoStar would be announced soon to fund this development. Now it seems that effort is on hold, leaving EchoStar without an obvious way forward to achieving global coverage (as it seems EchoStar considered but rejected the idea of buying Inmarsat last fall). There are also other more speculative projects that need to show some progress to remain credible. When it was disclosed by the WSJ last month, SpaceX’s business plan for its satellite internet service was widely dismissed as laughably unrealistic. However, I believe that in fact this is not the business plan that corresponds to the current system design, and instead SpaceX will be seeking a large amount of US government money to fund its constellation. Compared to SpaceX and OneWeb, Telesat’s constellation ambitions have largely been ignored by commentators, despite Telesat’s priority claim to the Ka-band NGSO spectrum band. So Telesat therefore also faces pressure to secure external investors in the near term so that it can keep pace with OneWeb. Now the question is whether caution amongst major existing players will make it harder for new entrants to move forward. Will it signal to investors that they should be cautious about investing in any satellite businesses? Or will it be perceived that new opportunities will face less competition from existing operators? The NewSpace community certainly seems to still be living in a bubble, despite the deeply negative implications of Google’s decision to abandon its efforts in satellite and hand over Terra Bella to Planet (not least because a sale to Google or other internet companies was seen as the most plausible exit for VC investors). So I look forward to seeing how much reality intrudes on the discussions at Satellite 2017. In late July, EchoStar raised $1.5B in debt, to add to its existing $1.5B in cash and marketable securities. Echostar’s lack of obvious need for these additional funds has led to considerable speculation about what the company’s intentions are, including the possibility of an Avanti acquisition. It seems very likely that there is no potential buyer for the company (otherwise the leak would not have been needed) and therefore Avanti will be forced to file for bankruptcy on or around October 1 when its next bond interest payment is due. Inmarsat would clearly be interested in certain Avanti assets, including Ka-band orbital slots for its I6 and I7 satellites and possibly the Hylas-1 satellite for additional European capacity, but these can be picked up in bankruptcy, likely for no more than $100M. And it is hard to imagine other mooted potential buyers, such as Eutelsat and EchoStar being more generous: Eutelsat has made it clear it does not intend to invest more in Ka-band satellites until they reach terabit-class economics, while Charlie Ergen’s past adversarial relationship with Solus and Mast (in DBSD, TerreStar and LightSquared) makes him very unlikely to bail out Avanti’s investors. At this point, it is therefore probable that there will be no buyer for Hylas-4, forcing Avanti’s bondholders to continue to fund its construction, if they want to avoid a NewSat-like situation, where the nearly completed satellite is simply abandoned and handed over to its manufacturer. 1) EchoStar could build its own global satellite system. This seems like the least plausible option, because there will already be at least three global Ka-band systems (from ViaSat, Inmarsat and SES). However, if EchoStar decides it does not believe the fully global opportunity is large enough, it could decide to just build a North America focused Jupiter-3 satellite (which would likely have a capacity of at least 500Gbps, and would have competitive economics to ViaSat-3). 2) EchoStar could partner with another operator. This is very plausible, especially as SES seems poised to announce its own GEO system soon, and would be keen to offload risk to an anchor tenant. Its even possible that EchoStar could build Jupiter-3 for North America, and partner in a separate global coverage effort with somewhat lower capacity. 3) EchoStar could buy another operator. This would be the most radical option, with Inmarsat the obvious candidate. There are many challenges here, not least that EchoStar might not be able to afford to buy Inmarsat, but the fit would be perfect, enabling EchoStar to leapfrog ViaSat to fully global coverage today, while being able to backfill Inmarsat’s limited GX capacity with its own HTS satellites. Moreover, Ergen would clearly attach significant value to Inmarsat’s L-band spectrum assets, not least in the leverage he could obtain over Ligado’s efforts to become a competing source of terrestrial spectrum to DISH in the US. Our industry is evolving with the increase in worldwide demand for broadband internet access for information, entertainment and commerce. In addition to fiber and wireless systems, other technologies such as geostationary high throughput satellites, low-earth orbit networks, balloons, and High Altitude Platform Systems (“HAPS”) will likely play significant roles in enabling global broadband access, networks and services…We may allocate significant resources for long-term initiatives that may not have a short or medium term or any positive impact on our revenue, results of operations, or cash flow. However, this new language appears to have related to Ergen’s discussions about a partnership with Google, which I noted previously, and Google appears to have opted for an alternative path for its wireless broadband buildout, with its recent acquisition of Webpass. As a result, I think EchoStar is likely to push forward with its satellite broadband efforts in the next month or two, presenting a serious challenge for ViaSat. That means its certainly not the case, as Jefferies wrote in its coverage initiation on ViaSat today, that “ViaSat-2/3 will give [ViaSat] the best bandwidth economics in the world (for now) and a de facto monopoly in residential broadband”. Indeed, I’d predict that although ViaSat will undoubtedly grow its satellite broadband business in North America very substantially (by as much as a factor of two) over the next 5 years, its extremely unlikely to pass EchoStar in the total number of subscribers, especially given the lead to market that Jupiter-2 will have over ViaSat-2 during 2017.